You want to do better with your spoken communication. Who better to turn to than the Ancient Greeks? They knew a thing or two about high-stakes verbal communication. Let’s kick it old school, like 2500 years ago. Hi This is 10 minutes to better patient communication. I’m Dr. Anne Marie Liebel. In this series, I take one communication question or issue that doctors have raised, dig deeper into with some research, then give you a strategy that you can use in your practice today. And I do it all in about 10 minutes. The physicians who speak with me want to be more conscious of their language. They know communication is important to what they do, and they want to know more about how language works, so they can be better doctors. That’s often why they’re talking with me. What do I need to know about communication to be better at it? What am I saying that is not contributing to patient care or safety? When communication breaks down, why is that? When communication is successful, why is that? One physician came to me after I’d done a grand rounds and said: “I do some of the right stuff you’re talking about, but I don’t know how I do it.” That made it frustrating for him to be able to talk to colleagues and students. They want some communication tools more meaningful and effective than good ol’ trial and error. They’re also not interested in some grab bag of tricks. I’m sharing some ancient wisdom (and not-so-ancient) on spoken language. The main idea I’m sharing here has endured for millennia. I suspect it’s because it’s a simple and efficient way to understand verbal communication. And you can use it to break down and assess your own communication, today. Starting now. It’s that easy. You know communication is important. Study after study show the influence of provider-patient communication on patient satisfaction, compliance, and clinical outcomes. Whether it’s medical interviewing or patient education; building relationships or making shared decisions–getting a grip on your spoken communication is essential. So I’m going to show you how. With some help from Aristotle. What I’m sharing here is based in classical rhetoric, we’re talking ancient Greece, with some more modern approaches layered on. Using classical rhetoric also been suggested by one study as promoting women-centered midwifery care. a meta-analysis of epidemiological research. Of course there are limitations, adaptations, and criticisms of classical rhetoric. I deal with some of these by layering in some critical discourse analysis, for its attention to interpersonal interactions and communication. I also include some New Literacies Studies for its attention to context and modality. 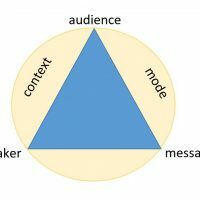 You may have seen something called the ‘rhetorical triangle.’ This is typically the three elements first identified by Aristotle as central to spoken communication: audience, speaker, message. These three elements, Aristotle argued, are the basis of a formal conversation. Frequently, that triangle is pictured with a circle around it. That circle portrays context, and mode. Can you picture a triangle, with a circle around it? Good. That’s what we’re talking about today. If you want a graphic there’s one on the website but it’s so simple you could draw it yourself. Or just google rhetorical triangle. We’ve got speaker, audience, message, context and mode. Briefly, here’s what each of those means. Context There are many contexts around any given communication. Time and space, also: cultural, economic, political, social, emotional, linguistic, etc. To keep it easy today, we’re going to consider the ‘mode’ as speech. So we’re talking about conversations. But this works for all modes as well as multimodal texts. Each of these 5 elements matters in communication, separately and together. These work because it’s so simple. You think of these 5 elements, you can break down any spoken communication. An easy way to begin to see how these 5 rhetorical elements work is to focus on someone else’s communication. I would suggest someone famous who does talking for a living. The next time you listen to a radio personality, someone on a talk show, news anchor, your favorite podcaster, think of the 5 elements. Speaker, audience, message, context, mode. Who does this speaker think he/she is? How does their language reveal this? Who do they think you are? How can you tell through their language? What do you think their central message is? What did they say that reveals this? What is their attitude toward a particular context they’re in? How can you tell? (Time can be an easy one to spot, or the political/economic/social climate). Thinking about these questions gives you a sense how these 5 elements can help you break down a spoken communication. Those questions we just asked about someone else? I’m offering you a way to ask them of yourself. This draws your attention to how your language is shaped by your thoughts. Your thoughts about yourself, your patient, your message, and your contexts. So you can say what you mean, and mean what you say. We all think we’re being clear: this is a way to check in on that. What kind of a person am I trying to be? How is my language reflecting this? What kind of a person do I think my patient is? How is my language reflecting this? What is my central message today? What am I assuming is most important in that message? How is my language reflecting this? What contexts am I paying attention to? Which am I considering very important, which not so important? How is my language reflecting this? This is a case where knowing more about language can help you do better with language. and Increase the chances your words will have the desired effect. Assessing in the moment is something you all do. This mental checklist, designed to help you assess your own language, is applying tools that have been used for over 2500 years. Communication is about more than imparting information. You’re also hoping to show yourself as a particular kind of person. You seek to influence people (though not in a creepy manipulative way). You also use language to build and maintain good relationships. This is one mostly-ancient way to consider separately the interconnected elements of spoken language. By looking at each, individually, you can see where you are–and aren’t–living up to your own goals for your language use. Consider engaging some trusted colleagues in looking at your language use together. Share with each other–and with us, here in the comments–what you’re learning about getting a grip on your language. With Aristotle.